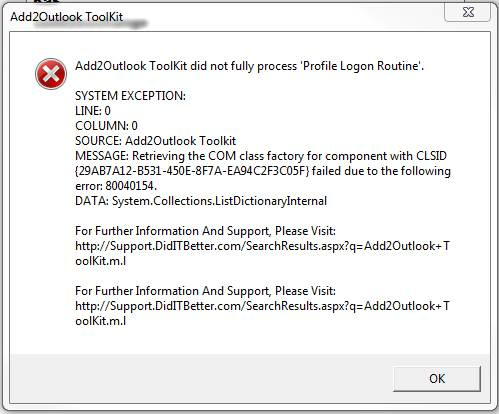 What is causing me to get an 80040154 error message in the Add2Outlook Toolkit? The 80040154 error may be caused by windows system files damage. The corrupted system files entries can be a real threat to the well being of your computer. We have found some interesting things regarding Outlook profiles in relation to this issue. Log in as a domain admin. Create a profile for another Outlook client. Give the effective permissions of the domain admin, not the service account. If it prompts you to give the password for the new mail account (and you are not logged in as domain admin) it should work; however, if it does not prompt you for the password it may not work. If this is the case, the domain admin was logged in. Be sure to log in as the user and create the mail account in Outlook; it should work every time if you do.